In a little over ten days Primsy*Whimsy will be the guest weekend artist on LolliShops. That means I gotta hustle my bustle and get things up on line. I'm starting today. I'll be posting as the days go on toward our grand opening on Jan. 9th! Most people leave home when they graduate high school. They go to exotic places for college or just one day up and move as far away from their home town as they can get. My Grammar School buddy, Kirk, moved to the west coast and then when that wasn't far enough...he left the mainland and now calls Kona, HI his home town. I was one of the lazy ones who moved only as far from home as the end of the road. If I go out my front door, down my drive, walk left 300 feet and turn right and walk 5.7 miles I'll walk right past Weinstein's on the corner of 16th Avenue in Lake Como, NJ. If I keep walking another six blocks I'll end up walking into the ocean I swam in as a kid. I still go back 'home' every once in awhile and today I took my camera with me to catch a glimpse of what once was and never again will be. So here it is my friend. Your Christmas trip back 'home'. Aloha and Merry Christmas! Sad to admit that I can't wait for Christmas to be over this year. There are very few gifts to be given this year because of our own personal economic woes. But there is still the spirit of love in the family and for that I am grateful. I think the adverts on TV make you feel like a failure if you can't load up on gifts for everyone and come dressed to any affair in sparkles and new duds. I'm concentrating on our lollishop (click icon at top of this post) because that's where I see the future as taking place. We'll start uploading Valentine's supplies after Christmas. I've been working on scanning, cleaning and preparing several Valentine collage sheets for download in our shop. Got some really nice ideas for Valentine's gifts as well. I love red so is it really any wonder why I love St. Val's Day. Just in case I don't have the chance to talk to you all directly or through email, I wish you the best, the merriest, the healthiest Holiday season you've ever had! It's the Holiday season but my head has been into our spring line of craft supplies and instruction CDs for Primsy*Whimsy, our new LolliShops Shoppe. Instead of wrapping presents for underneath the tree I spent the week working out the instructions for making a faux feather tree. I am a penny pincher and figured out how to create it for under ten dollars! You can see that it still needs finishing but I just HAD to show it off to everyone I know. I'm in love with feather trees! I chose to make it in a Shabby Chic PINK but it could be made in any color that pleases your fancy. Keep your eyes open for this upcoming craft project that is an original Primsy*Whimsy design. All designs are copyrighted and subject to the copyright protection law. Carolyn Sadowski is the originator of this design on 12/19/08. The PrimsyWhimsy girls are stocking their shop for spring. If you have any requests for specific products for us to hunt for please let us know. We want to have to most outstanding collection of unique crafting supplies on the LolliShop site. In order to do that we need to know that what we love, you will love as well. Just leave a comment on this posting and we'll definitely look into finding what you need. We've got a gazillion contacts after all these years PLUS a couple of storage units full of goodies that we'll be sorting through soon. Never know what might pop up and if we know you're looking, we'll make sure you're the first to know we're stocking it! It's been one of those years. And now it's almost over and I'm feeling the Holiday Blues. I don't remember when I felt the magic, the happiness that Christmas once brought me. I think it might have been when my children were young. My youngest is now 29 so that means it's been a long, long time ago. And I feel guilty! No, I don't have a lot of money but I do have my health now. Four years ago I was in the middle of chemo therapy. In fact, four years ago yesterday I was on a surgeon's table while he worked to remove the plastic port tubing that had lodged in the right atrium of my heart. So, yes, I have a lot to be thankful for in those terms. But not being able to bake, to buy gifts, to be out and about in holiday crowds is affecting how I am feeling. That's shallow, isn't it? Thinking that material possessions are what should make me happy. But isn't that what we're taught Christmas is all about? As a kid, I would line up with the town's children and wait my turn with Santa. It was the mid-50's and the country was on an endless high of happiness. Or so it seemed to me at the time. And the gifts they gave us at those Santa visits were elaborate. No skimping on making the children's eyes twinkle. Each one wrapped in bright Christmas paper, hiding something special and magical. I never thought about it until now but someone must have realized how artistic I was because each year I got something art related. Of course! It must have been my Dad's friend who was a fireman. Henry "Hank" Poland always made sure that I got the perfect gift. And believe me, it WAS perfect. And I remember the Sunday he took me aside after church and told me not to show up at the firehouse that afternoon. "You're ten now and no longer qualify for a gift". Was that when I felt the magic start to ebb away? The magic dim because I was now on the 'outside' looking in? I don't mean to infer that I had a sad childhood or ever lacked for gifts. Quite the opposite. Christmas was a wonderful time of year but I think it must have been that Sunday morning 'talk' with Uncle Hank that tarnished the magic for me. And I think I have spent the last 49 years trying to get it back. Hmmmm...I've given myself a lot of food for thought with this post. And to think I started it off with an entirely different direction in mind. I'm going to climb into bed soon. I've pre-heated the covers with a heating blanket and it will serve to ward off the chill of the house. We've done without a heating system for five years. In fact, we've done without a lot of things for the last seven. But I have hope. If we're lucky, this country will return to the hopefulness of the 50's. And with the return of hope, perhaps a little of the magic may return as well. I want to introduce you to an artist that can make me smile no matter how bad the day may seem! Jennifer Nilsson, the heart and art behind Mouser-kins™ produces not only sweet as sugar characters, but her own sweet self is someone I feel privileged to have come to know through our association with the wonderful site, www.Lollishops.com. One of her characters that I absolutely adore is the PepperMint Fairy. She has him available as a set of four blank notecards. Click the picture below to go directly to that auction or search LolliShops.com for Mouser-kins in the keyword search. You can go directly there by clicking on the logo below or on the title of this blog post. I LOVE my LolliShop. It's such an amazing community that surrounds it. With Sadie Hartmann at its helm, Lollishops is going to BE the place to BE in a very short time! http://www.facebook.com/group.php?gid=54071570638 is a group I started on facebook for all Lolli Lovers to post links to their shops. I think the more we network together the better the sense of community and the better our chances of success in each of our shops. If you want to start your Lolli experience, feel free to start with: http://www.lollishops.com/primsywhimsy My sister and I are starting a craft supply business that will bring together some of the more unusual types of craft items. Vintage ones as well as our own handmade line of goodies. I am completely psyched about this site and totally support Sadie Lou and her crew and give them kudos for all of the work they are doing. Turn up your sound and WAIT! There was a game we played as children. You had to be blindfolded and be trusting enough of your friends and/or family that they would not put you in harm's way. That's how I've been feeling lately. I've been blindfolded. Groping around in the dark trying to decide if I dared to move ahead without fear. With trepidation I announced to my customers on Sunday that I would no longer be selling Avon. It's been my saving grace, my pocket money, my little bit of security against total financial insecurity. But my customers have been dropping off one by one because of their own financial problems so that it has left me hardly breaking even. The amount of work for just a few dollars would be better invested in my new LolliShop, PrimsyWhimsy. So I did it, put in my last order, 30% of which are gifts for family and friends. And then by stepping off into the void I hit the bottom and bounced up, up and away!! I received an email from the owner of LolliShops: "Hello! 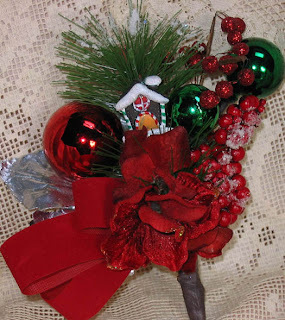 I would like Primsy Whimsy to be the Weekend Artist the weekend of January 9th-12th". Amazing, spine tingling serendipity OR the plan the universe had for me all along and was just waiting for me to step off and find my wings? 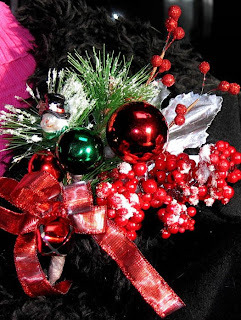 If you're someone who remembers the Holiday Corsage that Mom or Grandma pinned on your collar at Christmas time, then you're gonna love the latest additions to my LolliShop. 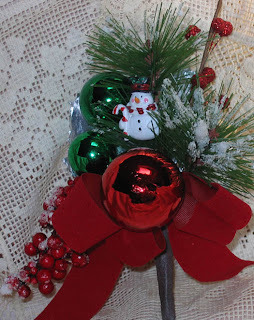 I've designed a number of OOAK Christmas Corsages based on the ones I remember from my girlhood. I wore my favorite one today and a beautiful older woman looked at it and said "Now it feels like Christmas". 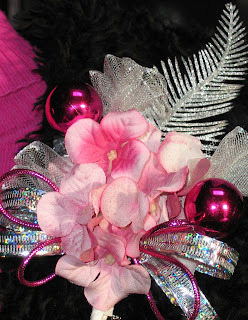 She, like me, would sport one of these merry corsages during that magical time of year! If you'd like to see these up close and personal, click on the icon at the top of this post. Here are a couple of photos of ones that are available as of 8 pm EST, 12.05.08. It's been a long time coming but finally my sister and I have opened a shop together. We're selling craft supplies and a few special gifts, etc on LolliShops. We're calling ourselves PrimsyWhimsy and if you click the logo above it will take you to our stash of goodies.